Next month is November and that means National Adoption Month! 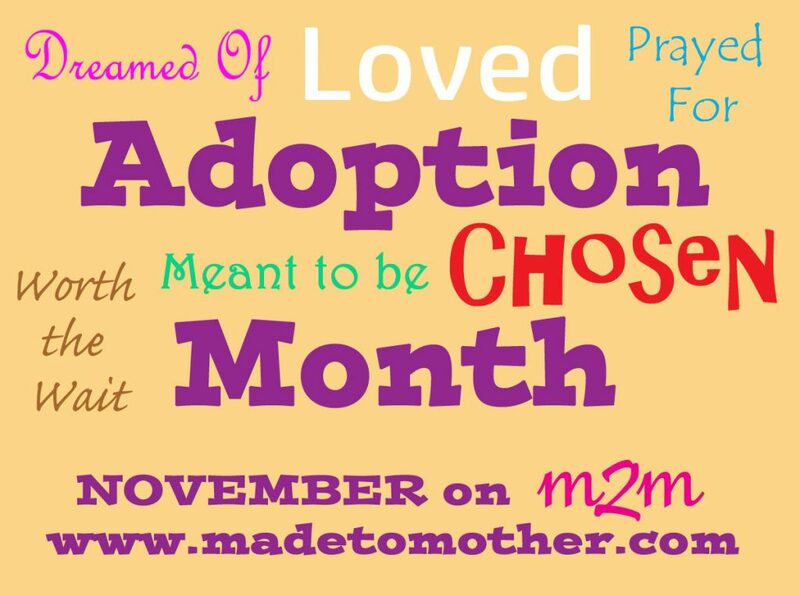 Every November I devote the whole month on Made to Mother for adoption stories, and I this year is no different! Get ready for a whole 30 days of stories that honor adoption…Birth mothers, adoptive mothers, adoptees, adoption-related organizations, and anyone else with a story about how adoption has touched them. Adoption is probably my all-time favorite cause. There is nothing more beautiful to me than the strong mothers who make up the two sides of adoption. The woman who makes the brave choice to give life and a future to a child, and then hands that child over to another. And the woman who receives that baby to love and raise as if it were her own flesh and blood. Both are mothers and both deserve to have a whole month to celebrate their roles. Of course there are many other influencing components in the complexity of adoption…the adoptee themselves, siblings, aunts and uncles and grandparents on both sides, adoption counselors, agencies, legal team, and caseworkers. The list can go on and on. Adoption touches so many different people and in many diverse ways. If you or someone you know has a story of adoption, or works for or has been impacted by a reputable adoption organization that they would like to share about on M2M during the month of November, please contact me, I would love to feature them! You can email me at wynter@madetomother.com.